Oaks are an in-between sort of tree in Assynt. They are much less widespread than downy birch or rowan, but commoner than bird cherry or wych elm. They are only present in numbers on south-facing slopes with reasonably deep, fertile soils, such as at Inverkirkaig, Baddidarach, Culkein Drumbeg and on the northern shores of Loch Assynt. 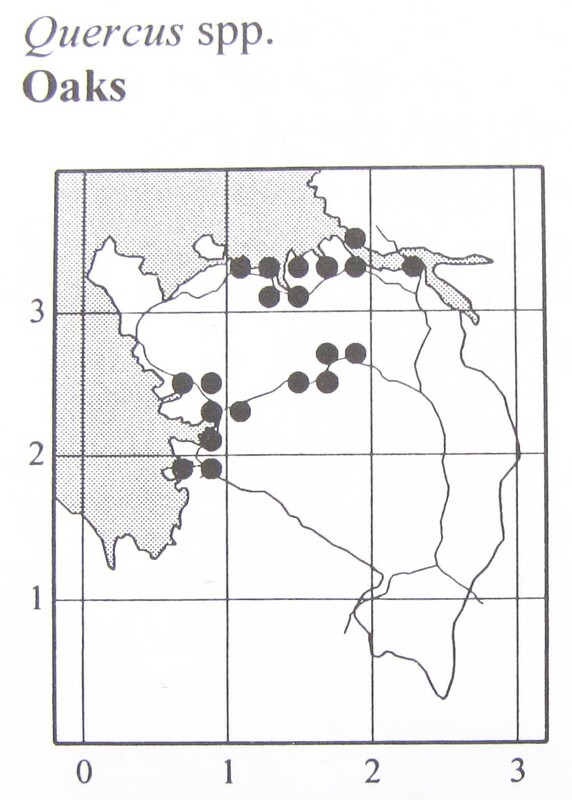 However, scattered trees are found along the north coast as far as Unapool (see map from Flora of Assynt, 2002) and they may have been commoner in the past. They are also in-between with regard to their parentage. The British Isles have two native oaks, pedunculate Quercus robur and sessile Q. petraea, so-named from the relative length of the stalks of their acorns (confusingly, the relative length of their leaf stalks is the other way round). They may also be distinguished by the shape and relative hairiness of their leaves, which is just as well in Assynt, where they only fruit sporadically. 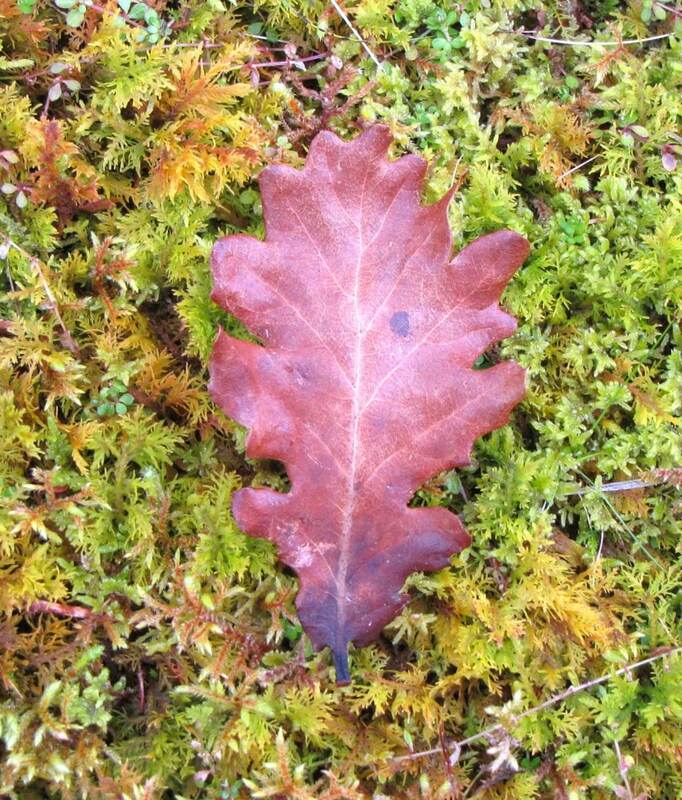 Most of our oaks seem to be examples of the variable hybrid between the two species, Quercus x rosacea. We were sitting having our lunch in a local wood containing some large oaks on 10th April, idly examining fallen leaves. Some of them had small transparent patches, where the substance of the leaf had been quite eaten away. 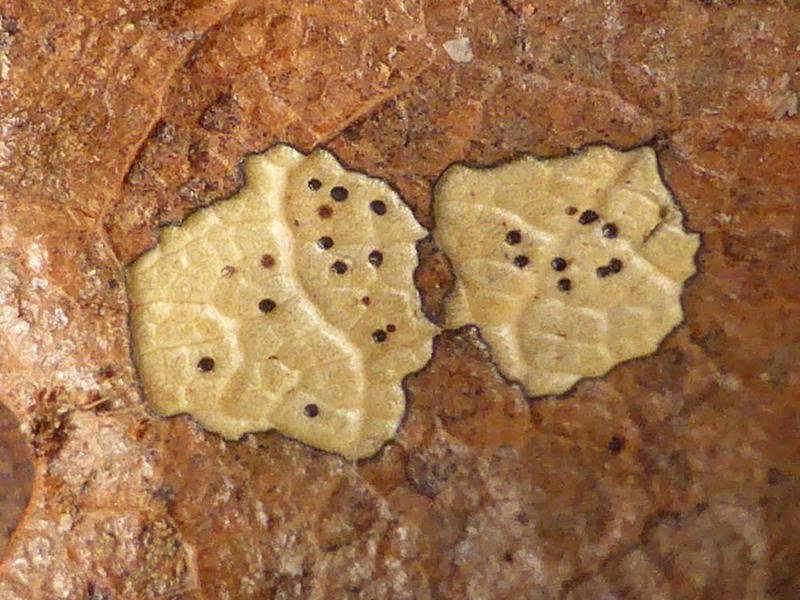 These patches were bounded by fine black borders and bore tiny black dots, likely signs of the work of a leaf-decomposing microfungus. We gathered a few for more detailed examination. Under a low-power microscope, the tiny black dots were confirmed as the fruiting bodies (apothecia) of an ascomycete fungus, almost certainly one called Camarosporium oreades, which the late John Blunt recorded just twice in Assynt. 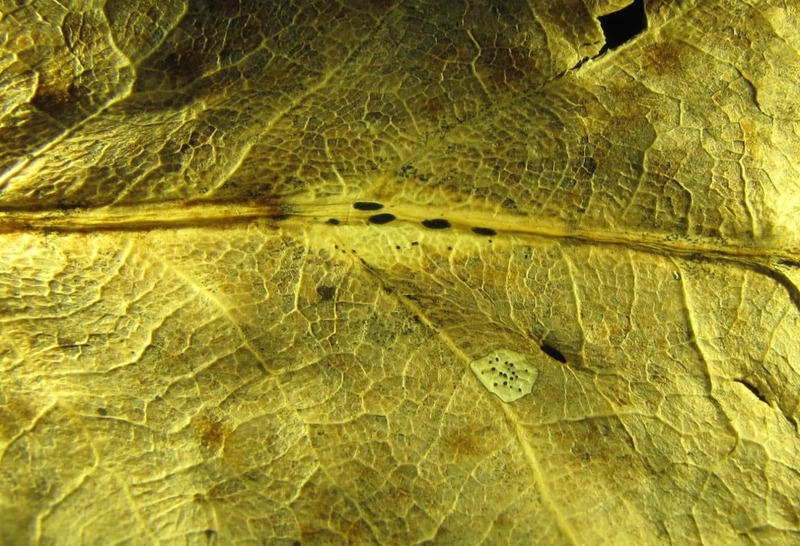 On further inspection, the midrib of one leaf bore the black, elliptical apothecia of another ascomycete fungus, Lophodermium petiolicolum, which he found only once. Oaks are known to support the richest community of insects and other invertebrates associated with any tree in temperate latitudes. We had no idea that they were also such a favourite with fungi. An identification handbook entitled Microfungi on land plants (Ellis and Ellis, 1997) lists some 68 species found on oak leaves, six on acorns and acorn cups and a further 64 on their wood and bark, and that does not take into account the larger mycorrhizal and wood-rotting species.